I have PDQ 3249 built in 2003. 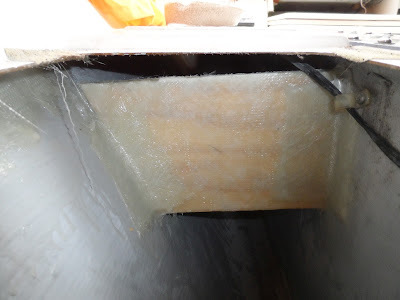 The fiberglass around the inboard diesel engine (twin Yanmar 2GM20F) mounts is separating from the hull. 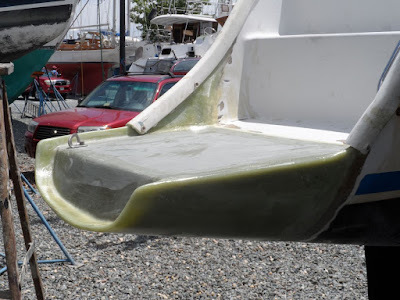 I spoke with a fiberglass company that my marina uses, and he said it would be $10k+ expensive to move the engines and repair. I'm wonder if other owners have also seen this and what they did. Pictures attached here. The cracks shown here are the worst, but both engines have this issue on both sides on the rear of the mounts. What I can tell you (many years of refinery expereince with FRP diesel tanks) is that if there have been diesel leaks (looks like there have been), the diesel has soaked into the FRP and getting a good bond is going to be very difficult. Just cleaning and working epoxy and glass in is not going to work. I'm afraid it looks like engine removal followed by considerable surgery. What do you think was the cause? Could it have been blocked incorrectly (right under the engine mount)? Did the drive take a hit? Possibly there is an insurance angle. Or did it just happen over time? I'm curious as to why they are lifting, even after cracking (there should be weight on them). I think there is something else wrong. Yes, over the years that was some fuel leaks and also some water and oil in the sump. The fiberglass guy http://www.customboatrepairs.com/jmla/ who looked at it said he thought the wood beams underneath the fiberglass was wet. I'm hoping the wood mounts are still secure, and it is just the fiberglass peeling away from the hull, but that may well not be the case. I did get a dock line fouled in the prop once, and that bent the drive shaft and had to be replaced. Perhaps that put enough force on the engine to loosen the mounts or begin to crack the fiberglass. I plan to do more exploration now that I have a sense of what the issue is. But I agree, the real solution is the big one with moving the engines and then reworking the entire mounts. I haven't noticed such separation on my '99 32 LRC. It looks like they didn't tab those motor mounts in very well on your boat. It does seem weird to me, like Drew (thinwater) noted, that they are pulling out. With a 250lb engine on them you wouldn't think they would pull up like that. Vibration and low RPM shaking might stress them and cause cracking (how are your motor mounts?) but I wouldn't think it would pull them up and out. Are all four corners pulling out like that? Or just one corner? If the latter maybe the engine was not balance properly. I would defer to Drew on FRP issues, he is far more knowledgeable than I. However, if it were me, I would first see if I could determine why the mount pulled up and out like that, and address that issue, if possible. Then I would jack up the engine a bit (might need to loosen/disconnect the mount(s) and shaft) and dry out the bilge and area under the mount thoroughly (e.g. leave a blow dryer on warm pointing at it for a couple days). Then I would re-epoxy the mount into place, but more importantly, re-tab the mount onto the hull. I would grind/sand off the gel coat to expose the underlying epoxy surrounding the mount, and heavily glass in new tabs, much wider than the existing tabbing. From your picture it looks like you have a few inches around the mount you could layer on several coats of glass to re-tab the mount into place. Then re-mount and re-align your shaft. Might as well replace the mount if the rubber is soft. Would this work? Maybe not. But I would certainly give it a try before laying out $10k and removing the engines. What do you have to lose? This presumes you have experience with laying fiberglass. Probably not a good first project to try working with fiberglass. ^^ In reality, I would probably try that. BUT I would figure on many cleanings (first hot degreaser, followed by xylene), followed by lots of grinding, followed by laying relatively large area of several layers of 17 oz. biax in order to get a good foundation and bond. At least 8 inches square under each mount. I would also really want to figure out why the engine is up first. That may be the correct location. Then I would shim the mounts so there was equal bear pressure. The 17 oz. biax is great for building strength with minimal bulk. My transom extensions were nearly solid biax, with just one layer of cloth to reduce print through. Easy to work with too. reedny wrote: Yes, over the years that was some fuel leaks and also some water and oil in the sump. The fiberglass guy http://www.customboatrepairs.com/jmla/ who looked at it said he thought the wood beams underneath the fiberglass was wet. Hey Reed, are you at Liberty Landing Marina? If so, be aware that the price you have been quoted has LLM's "upcharge" on top of what the contractor charges. It might be worth asking Bill N. if the charge would be less if he worked from a different yard. I am at Liberty Landing Marina, I will talk to Bill about that, thanks. The 17 oz. biax looks very good, thanks. I've not worked with FRP before, but knowing any good ideas is very helpful. The cracks are mostly on the rear mounts, not the front. They are not even on all corners, so maybe the engine is not correctly balanced and pulling on one area. Here is a photo taken with a remote camera that I snaked into the largest crack. It looks to me like the area under the FRP is hollow, and the engine mount bolt attaches to the top of the FRP area. I don't see any wood or other material that the bolt attaches to, just the top of the FRP mount area. Note the angle is looking mostly up, so the bolt is at the lower left of the photo.